At least five people whose legs were completely paralyzed are walking again, two of them with no outside help, thanks to a specialized program of therapy and a pain stimulator implanted in their spines, researchers reported Monday. It’s the latest and most dramatic advance in a new approach to treating spinal cord injuries developed at the University of Louisville in Kentucky. The reports show that electrical stimulation of the spine, when combined with a very intense and specialized training program, can re-educate the body and help move the legs even though signals from the brain are cut off. “The spinal cord can relearn to walk independently,” said Susan Harkema, who leads the Kentucky Spinal Cord Injury Research Center and who led the team that developed the new approach. It might be that the spinal cord can act on its own, almost completely without signals from the brain, Harkema told NBC News. “It can relearn. We can retrain it to function even though there is that injury disconnecting it from the brain,” Harkema said. Jeff Marquis, 35, walked close to 100 yards in a single session using the device. He can now live independently, without the helper who once had to come get him out of bed every morning. “I can do that on my own now,” Marquis said. Marquis was 28 and living an extremely active life as a chef in Whitefish, Montana, when a mountain biking excursion changed his life. “I was going down a trail that had a bunch of jumps that I normally skipped,” Marquis said. Marquis was paralyzed from the chest down, with only a little movement left in his arms and wrists. He had to learn how to breathe again without a ventilator. Cooking was out of the question, and he moved to Louisville to take part in the team’s project using a Medtronic pain stimulator to try to reignite the powers of the spinal cord. In 2014, the institute made news when four paralyzed men had their feeling and some movement restored using the device. The team has been working to perfect the program. The stimulator is implanted into the epidural layer surrounding the spinal cord, and sends controlled signals into the bundle of nerve tissue. The team also employs intense training techniques to try to get the body to make sense of the signals. “It’s a very distinctive type of therapy,” Harkema said. Team members move a patient’s legs in specific ways designed to cue the spinal cord into acting independently. “The trainers move the legs in a specialized pattern that mimics walking,” Harkema said. Eventually, patients are moved to a treadmill, and now the team has helped four walk without the treadmill. “There were three types of training sessions: stepping on a treadmill, over-ground standing, and over-ground walking, with each type of session performed daily,” the team wrote in their report, published in the New England Journal of Medicine. Two still need support and help from human trainers, but Marquis and another patient, 23-year-old Kelly Thomas of Citrus County, Florida, can walk alone using a walker or a cane. “The first day I took steps on my own was an emotional milestone in my recovery that I’ll never forget, as one minute I was walking with the trainer’s assistance and, while they stopped, I continued walking on my own,” Thomas said in a statement. Marquis has started baking again, using specially designed equipment to help him pull pans out of the oven. “Eventually I need to go back to school and figure out a new career,” he said. A second team at the Mayo Clinic reports somewhat similar results using the Louisville approach. 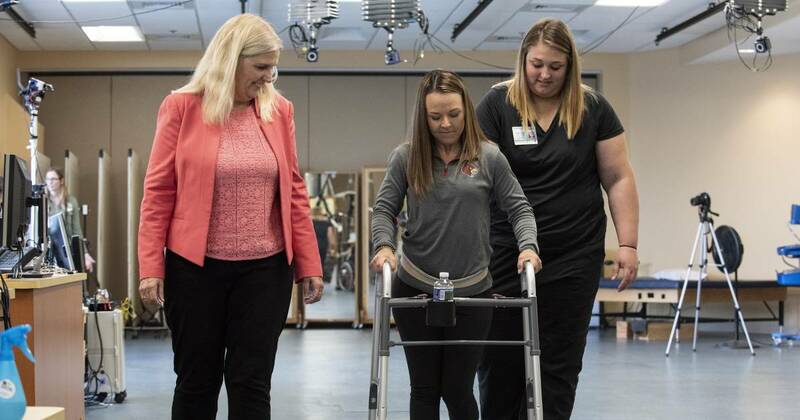 In their study, published Monday in Nature Medicine, they report on one of two patients they have treated, who can walk with the assistance of physical trainers. Harkema says her team will now go back to the four men who made headlines in 2014. All four are still using the stimulators, but have yet to walk unassisted, Harkema said. She hopes that applying the techniques developed over the past years will help them move better on their own. Harkema said the spine is much more independent of the brain than had been thought. It’s the same principle that is at work when a chicken continues to run around even after its head has been cut off, she said: the spine can signal muscles to move, independently of the brain. In the paralyzed patients, she said, her goal is to retrain the spine and the muscles of the body to move without a direct brain connection. Eventually, she hopes, it will be possible to do this without an implanted stimulator. She also hopes to treat people with older spinal cord injuries, although it does seem that the more recent the injury, the easier it is to help the patient recover some voluntary movement. Ethiopian Airlines: What do we know about Boeing 737 Max-8? March 10, 2019 Comments Off on Ethiopian Airlines: What do we know about Boeing 737 Max-8?